I am in Brussels, the heart of Europe and would be working here all through the week. The event I am attending began yesterday. It is a carnival to examine innovation and build pillars and models for growth in Europe. When I checked into the hotel which the European Commission had booked for me, my name popped up: the associate said “Welcome, you are a regular”. Yes, I have been coming to this event and Europe did great, upgrading me from Business Class to First Class this time. Certainly, they do appreciate the value we are adding through Fasmicro Group (my company) and African Institution of Technology (my non-profit). Today, we had a conversation with some of the leading European Banks. It was coming out of the open banking legislation in the United Kingdom. In my talk, I presented three core pillars (and product frameworks) for what I have called Platform-Banking Era. (I will not share that publicly, yet, as I have a talk coming up in South Africa with clients and would not want it to be boring to them. They need to hear me live first before the “declassification”). Tomorrow, I will be speaking on the nature of work and the day after, I will talk on global technology. Most times, I present the fusion of global and Africa, helping those without African operations to understand how change is happening. For example, MPESA remains a mystery and WeChat confuses many bankers in Western hemisphere. The future of consumer payment has been built in China. Yes, Alipay and WeChat have demonstrated that digital companies can build a payment system where no bank could get a cut of the action. That is just the beginning. Even as Nigerian banks are falling over themselves to work with Visa and MasterCard, China has already moved past the era of cards. And I do think the future is going to be where no one would need a debit or credit card to do consumer transaction. Simply, banks would be the entry elements into the ecosystems and once the money is there, customers can move the money to their digital wallets from where they would pay for things. As they do that, there would not be a need to do anything with banks. If that happens, banks become dump pipelines just as telcos have become dump pipelines for Skype and WhatsApp. That would happen if the banks do not take actions. It happened in China, and many banks have paid heavily with erosion of value. 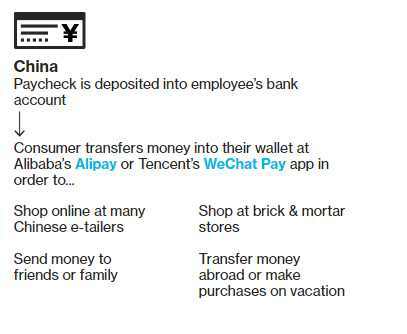 The interesting thing in WeChat and AliPay is that they are making it easier for users to stay longer in their ecosystems through different solutions, services and products they offer to customers. And if they do just that, the need for the typical banking fades. This is already causing major problems with some small Chinese banks where liquidity has become a challenge. Specifically on that, the Chinese banking regulator has to request that the BAT( Baidu, Alibaba and Tencent) move funds from their wallets to their bank accounts within 72 hours as local banks were having liquidity issues [yes, that does not help local banks. It only helps the banks where the BAT bank]. Alipay and WeChat command 520 million and one billion monthly active users, respectively. Together, both moved $2.9 trillion in 2016. That number has been estimated to be excess of $3.5 trillion for 2017 [the companies do not disclose the numbers]. The payment system in Nigeria is anchored on our banks. That is expected as we are mirroring U.S. and Western Europe in our strategy. That is why every payment connects back to banks, from cheque, debit, credit (where available) and fintechs. For the fintechs, the systems are largely designed to tie directly to the banks. The implication is that it is still the banks. The element of abstraction and disintermediation is not real because our banks are still at the center of the hubs. Breaking that hold on banking is where the opportunity lies. But it would not be easy. Anyone that does that in Nigeria would win it all. The Chinese experiment makes that very clear. Yes, I am not sure we hear of Chinese banks, but we know of WeChat and Alipay because these ecosystems are huge and growing. In Africa, Facebook and Instagram are potential suspects if regulations would allow them. They are already working with Nigerian banks. The banks are doing what they have to do: with Facebook Corp, there is no other alternative – you either fall in line or you go extinct. This is going to be the future of banking in Nigeria. No one goes to a bank in China; most go to WeChat to do banking. Facebook has a plan for that in Nigeria. The plan is now under execution. Yet, besides the technology, one has to change the attitude of Nigerians. For this to work, Nigerians would be open to park their cash into apps from their bank accounts. That may not be easy; we are yet to become believers of digital ecosystems [blame Yahoo boys for that]. But where that happens, it means the digital ecosystems would use that money to lend, extending their powers over banking institutions. Meanwhile, Chinese consumers are starting to park more of their savings with the apps. In 2013, Alipay began offering money-market accounts. By last year, it had built that business into the world’s largest money-market fund with about $243 billion. For banks, that’s yet another bite. They traditionally hold customer deposits and use that money to fund loans—generating significant profits. If U.S. consumers were to start storing their extra cash with apps, banks would have to find an alternate—probably more expensive—source of funding. If you are looking for wealth online, do not look further: a platform like WeChat is what will deliver the glory. Just as MPESA in Kenya is trying to transmute its solution into an ecosystem, expect many Nigerian banking apps to have the same plans. GTBank (Nigeria) wants to do the same thing as noted in its grand strategy by the CEO. Yes, GTBank wants to meet your basic needs, not just the banking needs, digitally. You would have to beat Mr. Segun Agbaje [very tough indeed] if you want to get the glory. But what needs to be done is very clear: banking will be part of social connections, and going forward, would not be measured by one-off transactions, at consumer level.